Clicking Today. This will bring you back to the current month from any other month. Clicking the previous month and next month arrow buttons to go a single month back or forward. Clicking the month/year dropdown. This will let you select a particular month and year to jump to directly. Click the currently selected calendar(s) to open the calendar selection slider. To select a single calendar, click the name of the calendar you want to display. Check the calendars you want to see and/or uncheck the calendars you want to hide. 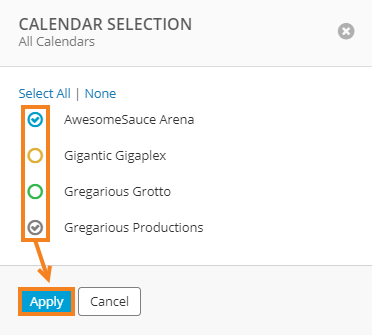 You can also use the Select All and None options to instantly select or deselect all calendars. Calendar blocks are colored according to the calendar they are on. 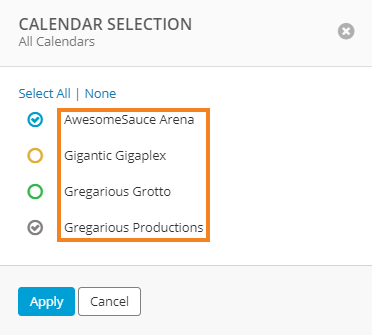 External calendar blocks are grey (by default) and each block displays the name of the associated venue. Confirmed dates display the name of the event in bold. Hold dates display the hold rank in bold followed by the event name. Announce dates have a megaphone icon followed by the event name. On sale dates have a ticket icon followed by the event name. Blackouts have a warning sign icon followed by the blackout's name. Calendar notes have a speech bubble icon followed by the note.